Jon Koons / Jestmaster, Inc.
> Jon Koons / Jestmaster, Inc. Kids' Party Entertainments > Jon Koons / Jestmaster, Inc. Awarded the title 'NYC's Plum Craziest Performer', Jon Koons is that rarest of entertainers, one who instantly develops a special rapport with his audience. Armed with virtually every variety skill, Jon is a true Multi-Talent who's quick wit and talent for improvisation keeps audiences amused and amazed. 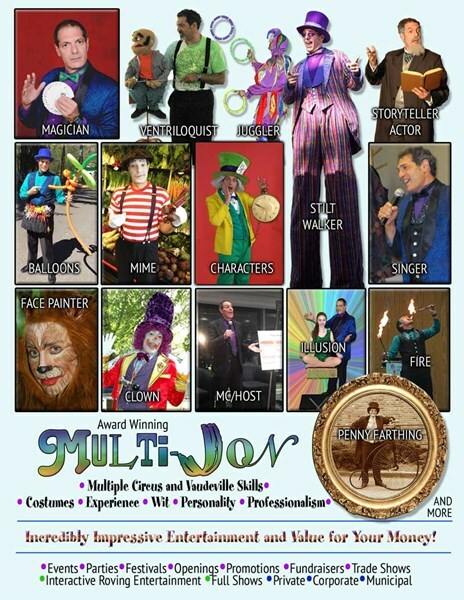 With experience ranging from Broadway, TV and Films to performances from Atlantic City to Kenya, whether performing on stage or interactively throughout the audience, Jon is the perfect choice to entertain for corporations, colleges, festivals, parties and events of every description. 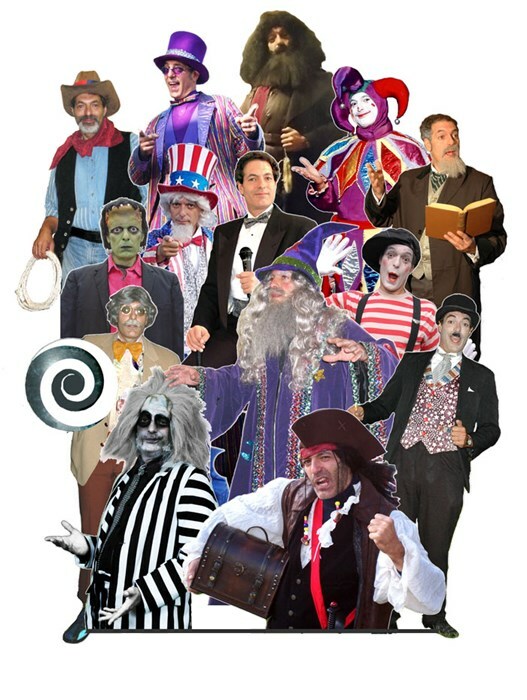 As his ebullient self, or as one of the dozens of characters he conjures up, with literally hundreds of costumes at hand, Jon will keep the audieince laughing and dazzled with his high energy antics and impressive array of talents. Jon is also the owner of JestMaster Productions, Inc. which provides unique entertainment of all types for any ocassion. If you need more than one performer, unusual specialty acts or complete event planning, we can do it all for you! Jon Koons was wonderful. He was everything I thought he would be. Thank you Jon you were the life of my party. You interacted with the audience. You were great. My friends and FAmily absolutely loved you. You will definetly be called upon in the future. Thanks Again for entertaining my guest. You were great. Hats off to Jon Koons!!!! Jon was very nice, accommodating, came in on time, professional, would recommend and use him again. The performers were FANTASTIC. They exceeded our expectations and truly provided the exact experience we were hoping to have for our guests. I can assure you if you hire Jon and his cronies you wont be disappointed! Jon got the job done quickly and very well! I will hire them again for sure!!! Thanks a lot. HE WAS PERFECT FOR THE EVENT! I would use jon again and recomend him highly. Excelent mix of humor and magic. He was loved bvy all. This was my first experience with Gigmasters and I must say I was quite pleased. Arranging this event with Jon Koons & Jestmaster was very easy and he delivered on every aspect of the contract as discussed. From a prompt arrival to the challenging task of captivating children's attention for an hour(as well as some of the adults)with magic, juggling and his ventriliquism, I got what I was hoping for from his performance. 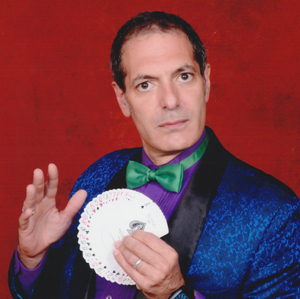 If you are looking for an entertainer who can do it all..consider Jestmaster! Thanks again Jon! he was not what i wanted. His magic acts were pretty childish. He did tricks i could have bought in a joke store.the whole time on stage he kept looking at his watch,wich was very rude.he did a rope trick,card trick and a ring trick, three tricks wich it took him 1/2 an hour. He sung THE CANDY MAN at an adult party, everybody was in shock !! I hired a magician not a singer. I kept telling my guest i was sorry. Over all I thought he was pretty BAD and third rate!! Please note Jon Koons / Jestmaster, Inc. will also travel to Englewood Cliffs, Teaneck, Tenafly, Bergenfield, Bogota, Leonia, Bronx, Cresskill, Dumont, Fort Lee, Hackensack, New Milford, New York, Palisades Park, Ridgefield Park, River Edge, Alpine, Demarest, Edgewater, Haworth, Little Ferry, Maywood, Ridgefield, South Hackensack, Teterboro, Yonkers, Cliffside Park, Closter, Fairview, Hasbrouck Heights.